The Fiddlers, Rautavaara's vivacious folk-music piano suite, (is) delivered in lively and fully competitive fashion by Jumppanen (...). Top-notch sound. Ondine's Rautavaara recordings really are major additions to the contemporary music scene. This one is no exception. La beauté des grands espaces, le tempérament national s'expriment dans des couleurs automnales et une très grande soupless de l'écriture. Lost Landscapes constituera pur beaucoup un très belle découverte, interprétée avec beaucoup de finesse par l'excellent Kuusisto. Kiinnostavinta antia levy tarjoaa Pelimannit-piano-sarjassa, jonka kutakin osaa Kuusisto alustaa alkuperäisellä Rinda-Nikkolan pelimannikappaleella. Kuusisto on sisäistänyt arkaaisen tyylin, koristelee taloudellisesti mutta käyttää jousta jatkuvasti vaihtelevin rytmisykkein. (...) Jumppanen esittää pianokappaleet erinomaisesti ja laittaa ne keskustelemaan alkuperäisten rinnalla. Experiencing the slightly earlier Dithyrambos, with its compelling dance rhythm and ripe sensuous harmonies, after Variétude is rather like tearing off a straightjacket and running round the garden naked. That it should have such an effect is partly a tribute to the spirited musicianship of Pekka Kuusisto and Paavali Jumppanen. Im vorliegenden Falle darf Rautavaara mit sich (...) ebenso zufrieden sein wie mit den beiden jungen finnischen Interpreten, die sich bravourös, empfindsam und risikofreudig durch die zwischen 1952 und 2008 geschriebenen Kompositionen hindurchspielen. Als sehr angenehm wird dabei empfunden, dass sich keines der Stücke in epische Breiten verliert, sondern (...) überdies oft genug mit Temperamentsausbrüchen verblüfft, die im Gegensatz zum statischen Gewusel der Neuzeit tatsächlich zielgerichtet sind. Kuusisto soittaa hivelevän kauniisti ja rohkean persoonallisesti ja Jumppasen pianonsoitossa on tahtoa, taitoa ja tarkoitusta. Pekka Kuusiston ja Paavali Jumppasen loistavissa esityksissä riittää sävyjä, intensiteettiä ja voimaa. This new recording features the complete works for violin and piano by Einojuhani Rautaavara (b. 1928), including many world premières. The performers are two of the most fascinating talents from Finland who are know for a fresh approach: violinist Pekka Kuusisto ("the very embodiment of joyful music-making" - The Toronto Star), who has made numerous praised recordings for Ondine; and pianist Paavali Jumppanen ("immense power and an extraordinary range of colours" - The New York Times), who has recorded, for Deutsche Grammophon, Pierre Boulez's complete Piano Sonatas to oustanding press acclaim. This CD also includes Rautavaara's opus 1, the piano suite Pelimannit (The Fiddlers), which is based on traditional polska tunes for the fiddle. 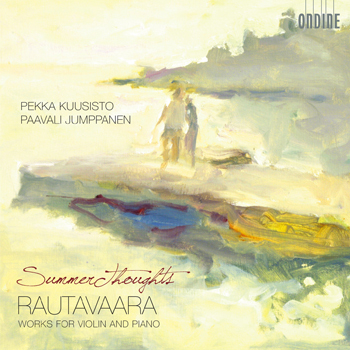 Following Pekka Kuusisto's concept, this recording for the first time presents the original violin tunes, alternating with the respective movements from Rautavaara's piano suite.